HYDERABAD: Around 100 Grameen Dak Sevaks (GDS) from Telangana and Andhra Pradesh, who gathered at the Indian Postal Convention Centre were a happy lot as their protests and strike seeking the implementation of the recommendations made by the Kamlesh Chandra Committee was successful, as some of their demands to the revision in their wage structure and allowance have been met with. 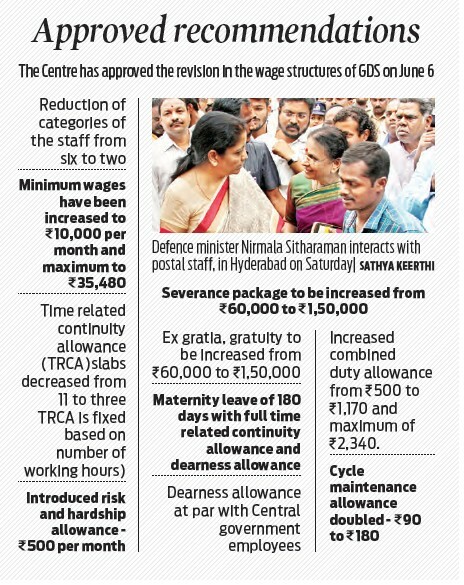 Defence minister Nirmala Sitharaman interacted with them at the Centre here on Saturday and informed them of the recommendations approved by the Union Cabinet for the revision of their wage structure along with some other allowances by the Department of Posts on Wednesday. In fact, GDS across the country stopped providing services, which led to a stall in the delivery of MNREGS wages, pension and other things which are delivered by them at the village and district-level. In Telangana alone, more than 10,000 GDS employees went on strike and later held a rally in Hyderabad. This revision in the wage structure would entail an expenditure of 1275.75 crore in the coming year and more than 3 lakh GDS will benefit from this. The minister, while pointing out that the GDS have been working for more than 150 years, said that they are the ones representing the central government in the rural areas. “After the Cabinet’s approval, the Prime Minister said that the GDS have been protesting respectfully and peacefully seeking their rights. It is only fair that they get what they are demanding,” the defence minister said. She added that they were given unfair treatment in the past with just `30 or so as an increment to their wages. “Apart from other things, we have also introduced maternity benefits for women dak sevaks,” she added.